This exercise adds inner thigh strengthening to the class Pilates Roll Up. To do this exercise you will need a mat and a magic circle. Start by lying on your back with your knees bent and the magic circle between your thighs. Inhale into the back of your ribs and then exhale as you squeeze the circle, reach your hands for your thighs and roll up to sitting. Inhale as you release the circle, and then exhale as you squeeze the circle once again and roll back down. If you have osteoporosis start this exercise in a seated position and as you squeeze the circle hinge your spine backwards about eight inches. Maintain a neutral spine. 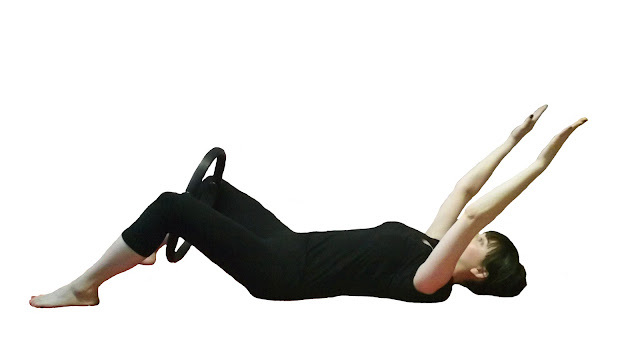 In this exercise the magic circle helps connect you to the midline. Use the engagement of your inner thighs to help you find the center of your body.